Yes, she came so close to dying. But I saved her. Of all the small things in life, my computer is one of top prized possessions. Okay, fine, she's a Microsoft Surface RT, and technically she's more of a 'tablet' than 'computer' (she operates mainly on apps, not programs). Make fun of Surfie as much as you want, she still has a special place in my heart that you heartless bastards will never have. It happened last week. I could turn on the computer, and the loading icon will show up. And then, the black screen of death struck. I couldn't get into Windows. I panicked. My mind went on overdrive. Cold sweat broke out. What if I lose her forever? What if I never see colours splashing on her face again? Why is this happening to me... to us... WHY, GOD, WHY? I calmed myself down, set my morning schedule aside, jumped on top of her and tried all within my power to resuscitate her. First port of call was Google (what else?). The official Microsoft trouble shooting guide was informative, but short on details. The 'hacks' provided by random people in online forums were way more helpful. 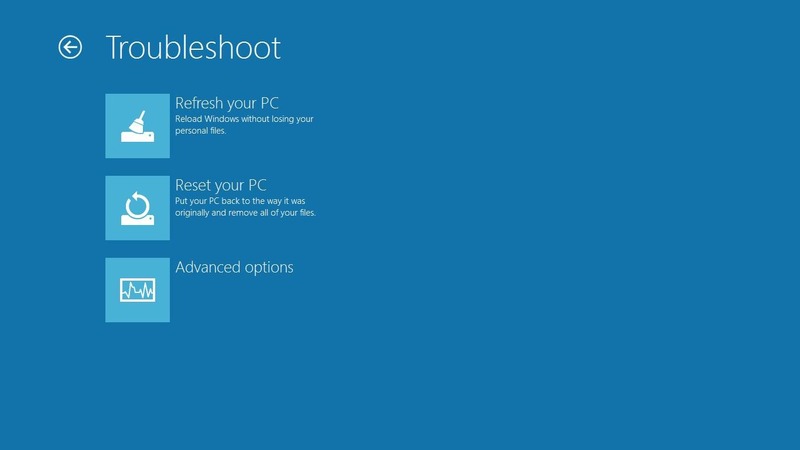 Through some fancy clicks, I managed to activate a troubleshooting panel outside of Windows. The cure came down to refreshing or resetting. Refreshing was the safer option, as it kept my personal files intact. Resetting was a complete reboot and clean memory wipe. Naturally, I tried the first option. But I hit a brick wall. An error message flashed back saying there isn't enough memory space to refresh. So I had to delete some files. But I couldn't get into Windows. Whoops! It looks like crap. Just streams of white lines on a black background. I had to manually type out commands to do simple tasks. Some commands I remember from my childhood playing around with my old school computer (yes, MS-DOS was the main desktop menu itself, there was no Windows back then). Some commands I got from online forums. Yes, feels like hacking the Matrix. As my computer was already low on my memory, I had to transfer files into a pen-drive. The process was slow, and painful. But whilst I could easily copy and move files from one 'directory' to another (or in modern terms: folders), I had trouble doing the same for entire directories. Even the online tips couldn't help. I could create mirror directories on my pen-drive, and then manually move files directory-to-directory. But that would probably take days. Ain't nobody got time for that! That's not how Neo rolls! At a lost, I called the Microsoft customer service hotline. IT Guy: What's the problem? Me: I can turn on my Surface, but I can't get into Windows. Gets stuck at loading page. Everything goes black. Seems more like a software than a hardware problem? Me: Okay, fine, but my main concern is my personal files. How do I save it? IT Guy: Is it synced to OneDrive? Me: Um... no... But isn't there a way I can try to reboot my computer or something? Me: Okay, cool. Now, back to my problem. 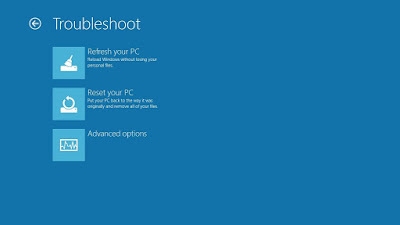 I found this troubleshooting panel, and I see that I can either refresh or reset my computer. It was about then that the line got cut off, and perhaps it was for the best. Seriously, what the f**k was that? Am I talking to Customer Service or Sales? I click on the "For Surface devices, press 2" option, yet I'm diverted to a person who knows absolutely nothing about Surface? Is he even human, or just a damn bot? So I went back to my hacking. I kept googling tips. I could turn on 'Notepad' through Command Prompt by just typing: "notepad". And through Notepad, I could click 'Files -> 'Open' and... ta da! It's a mini Windows Explorer! Thank the Lords! So now I can easily move files around as usual! I no longer had to navigate though the Matrix in code, but visual interface. I felt like Neo once again! Anyway, long story short: I still couldn't refresh my computer even after moving files and making space, so I had to reset instead (after saving all my files into my pen-drive, of course). Which rebooted my entire Windows, and wiped all the memory clean. MY NAME IS (NOTEPAD) NEO!!! Look, I'm sure Microsoft knows of all these hacks. But they deliberately chose not to lay them out in their troubleshooting links, and instead direct their customer service sales people to advise customers on how to fix their old computers to buy new stuff. That's dirty. That's evil. AND YOU TOLD ME SURFIE WAS DEAD! DEAD!!! YOU LIED! LIAR LIAR PANTS ON FIRE!!! Maybe the younger folks wouldn't know this, but fixing computers was so much easier back in the old days. You could reboot it on your own (the troubleshooting guides were wayyy more helpful), and you could always go to a computer shop (this was my last option, but I have a feeling that they wouldn't be able to help much anyway, with computers being a more 'closed' system these days). Everything breaks faster and easier these days, and not just computers. Things just aren't build to last. And that's sad because computers - just like love - should be more about stability than flashiness, and they aren't. I love my computer. So do most of you. And these companies now want us to replace our computers as fast as we swipe for dates on Tinder. No way, that's not we want, that's not what we deserve. Technology is a friend, not slave. Surfie is a great girl. She's served me well, despite her inherent flaws. And right now, I'm writing this through her... with her. Welcome back, Surfie. I won't let evil tear us apart. Love will keep us alive.